The Oder-Neisse line ( , ) was drawn in the aftermath of World War II as the eastern border of Germany and the western border of Poland . The line is formed primarily by the Oder and Lusatian Neisse rivers, and meets the Baltic Sea west of the seaport cities of Szczecin (German: Stettin) and Świnoujście (Swinemünde). All pre-war German territory east of the line (23.8% of the former Weimar Republic lands, most of them from Prussia ) was either awarded to Poland or the Soviet Union after the war, and the vast majority of its native German population was expelled by force. The line marked the border between the German Democratic Republic and Poland from 1950 to 1990. In 1990 newly reunited Germany and the Republic of Poland signed a treaty recognizing it as their border. Before World War II, Poland's western border with Germany had been fixed under the terms of the Treaty of Versailles of 1919. It partially ran along the historic borders of Greater Poland, but with certain adjustments that were intended to reasonably reflect the ethnic compositions of small areas beyond the traditional provincial borders. However, Pomerelia and Upper Silesia had been divided, leaving areas populated by a rural Slavic population (often Germanized) on the German side and some German, primarily urban populations on the Polish side. Moreover, the border left Germany divided into two portions by the Polish Corridor and the independent Free City of Danzig , which had a predominantly German urban population, but was split from Germany to help secure Poland's access to the Baltic Sea . It was the Soviet leader Josef Stalin who had first insisted that Poland's western frontier be extended to the Oder River at the Tehran Conference in late 1943. The Americans, however, were not interested in discussing any border changes at that time. British Foreign Secretary Anthony Eden wrote in his diary that "A difficulty is that the Americans are terrified of the subject which [Roosevelt advisor] Harry [Hopkins] called 'political dynamite' for their elections. But, as I told him, if we cannot get a solution, Polish-Russian relations six months from now, with Russian armies in Poland, will be infinitely worse and elections nearer." In February 1945, American and British officials met in Malta and agreed on the basics on Poland's future borders. In the east, the British agreed to the Curzon line but recognised that the US might push for Lwow to be included in post-war Poland. In the west, Poland should receive part of East Prussia, Danzig , the eastern tip of Pomerania and Upper Silesia. This would necessitate the transfer of 2.5 million Germans as opposed to 8 million from a border on the western Neisse.At the subsequent Yalta Conference , the subject of Poland was again discussed. President Franklin D. Roosevelt said that it would "make it easier for me at home" if Stalin were generous to Poland with respect to Poland's eastern frontiers. Winston Churchill said a Soviet concession on that point would be admired as "a gesture of magnanimity" and declared that, with respect to Poland's post-war government, the British would "never be content with a solution which did not leave Poland a free and independent state." With respect to Poland's western frontiers, Stalin noted that the Polish Prime Minister in exile, Stanisław Mikołajczyk, had been pleased when Stalin had told him Poland would be granted Stettin (Szczecin ) and the German territories east of the Western Neisse River . Yalta was the first time that the Soviets openly declared support for a German-Polish frontier on western (Lausitzer) as opposed to eastern (Glatzer or Klodzka) Neisse. Churchill objected to the Western Neisse frontier saying that "it would be a pity to stuff the Polish goose so full of German food that it got indigestion." He added that many British would be shocked if such large numbers of Germans (more than 11 million) were driven out of these areas, to which Stalin responded that "many Germans" had "already fled before the Red Army." Poland's western frontier was ultimately left to be decided at the Potsdam Conference. Originally, Germany was to retain Stettin , while the Poles were to annex East Prussia with Königsberg (now Kaliningrad ). The Polish government had in fact demanded this since the start of World War II in 1939, due to East Prussia's strategic position that allegedly undermined the defense of Poland. Other territorial changes proposed by the Polish government were the transfer of the Silesian region of Oppeln (Opole) and the Pomeranian regions of Danzig (Gdańsk), Bütow (Bytów) and Lauenburg (Lębork), and straightening of the border somewhat in Western Pomerania. The eventual border was not the most far-reaching territorial change that was proposed. There were suggestions of including areas further west so that Poland could include the small minority population of ethnic Slavic Sorbs who lived near Cottbus and Bautzen . Ironically, those Sorbs who lived in the areas annexed by Poland would in fact be expelled as "Germans". The precise location of the western border was left open. The western Allies accepted in general that the Oder River would be the future western border of Poland. 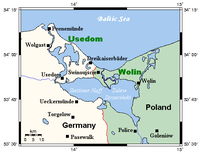 Still in doubt was whether the border should follow the eastern or western Neisse River , and whether Stettin (now Szczecin), the traditional seaport of Berlin and a city with an exclusively German population, should remain German or be placed in Poland (with an expulsion of the German population). The western Allies sought to place the border on the eastern Neisse at Breslau, but Stalin refused to budge. Suggestions of a border on the Bóbr (Bober) river were also rejected by the Soviets. James Byrnes – who had become the American Secretary of State earlier that month – later advised the Soviets that the U.S. was prepared to concede the area east of the Oder River and the Eastern Neisse (Nysa Kłodzka) River to Polish administration, and for it not to consider it part of the Soviet occupation zone, in return for a moderation of Soviet demands for reparations from the Western occupation zones. A Nysa Kłodzka boundary would have left Germany with roughly half of Silesia. The Soviets insisted that the Poles would not accept this. The Polish representatives (and Stalin) were in fact willing to concede a line following the Oder-Bober-Queiss (Odra-Bóbr -Kwisa) rivers through Żagań (Sagan) and Lubań (Lauban), but even this small concession ultimately proved unnecessary, since on the next day, Byrnes told the Soviet Foreign Minister Vyacheslav Molotov that the Americans would reluctantly concede to the Western Neisse. Byrnes's concession undermined the British position, and although the British Foreign Secretary Ernest Bevin raised objections, the British eventually agreed to the American concession. In response to American and British statements that the Poles were claiming far too much German territory, Stanisław Mikołajczyk argued that "the western lands were needed as a reservoir to absorb the Polish population east of the Curzon line, Poles who returned from the West, and Polish people who lived in the overcrowded central districts of Poland." The U.S. and the U.K. were also negative towards the idea of giving Poland an occupation zone in Germany. However on July 29, President Truman handed Molotov a proposal for a temporary solution whereby the U.S. accepted Polish administration of land to the Oder and eastern Neisse until a final peace conference determined the boundary. In return for this large concession, the U.S. demanded that "each of the occupation powers take its share of reparations from its own [Occupation] Zone and provide for admission of Italy into the United Nations." The Soviets stated that they were not pleased "because it denied Polish administration of the area between the two Neisse rivers." Not only were the German territorial changes of the Nazis reversed, but the border was moved westward, deep into territory which had been in 1937 part of Germany with a mainly German population. The new line placed almost all of Silesia, more than half of Pomerania, the eastern portion of Brandenburg , a small area of Saxony , the former Free City of Danzig and the southern two-thirds of East Prussia (Masuria and Warmia) within Poland (see Former eastern territories of Germany). The north eastern third of East Prussia was directly annexed by the Soviet Union , with the Memelland becoming part of the Lithuanian SSR and the bulk of the territory forming the new Kaliningrad Oblast of the Russian SFSR. These territorial changes were followed by large-scale population transfers, involving 14 million people altogether from the whole of Eastern Europe, including many people already shifted during the war. Ethnic cleansing carried out by the Polish government and military and the Soviets resulted in the expulsion of nearly all remaining Germans from the territory annexed by Poland and the return to Poland of Polish displaced persons then inside Allied-occupied Germany. In addition to this, the Polish population originating from the eastern half of the former Second Polish Republic , now annexed by the Soviet Union, was mostly expelled and transferred to the newly acquired territories. Few Poles have opposed the territorial gains from Germany and the expulsion of the German inhabitants. These developments have been presented as a just consequence for the Nazi German state starting the war and conducting genocide, as well as for the territorial losses of eastern Poland to the Soviet Union, mainly Ukraine , which Poland had gained in the Polish-Russian war earlier in the 20th century. With respect to the expelled ethnic German minority in Poland, resentment has been based on the majority's loyalty to the German Reich during the invasion and occupation, and the active role played by some in the persecution and mass murder of Poles and Jews. These circumstances have impeded sensitivity among Poles with respect to the expulsion committed during the aftermath of World War II. In West Germany , where the majority of the 12 million displaced refugees found refuge, recognition of the Oder-Neisse Line as permanent was long regarded as unacceptable. In fact, under the Hallstein Doctrine, West Germany recognized neither the government of Communist Poland, nor the German Democratic Republic (East Germany). The 1990 German-Polish Border Treaty finalizing the Oder-Neisse line as the Polish-German border came into force on January 16, 1992, together with a second one, a Treaty of Good Neighbourship, signed in June 1991, in which the two countries, among other things, recognized basic political and cultural rights for both the German and the Polish minorities living on either side of the border. After 1990, approximately 150,000 Germans still reside in the areas transferred to Poland, mainly in the Opole (Oppeln) Voivodeship, with a smaller presence in regions such as Lower Silesia and Warmia-Masuria . There are one and a half million Poles or ethnic Poles living in Germany, including both recent immigrants and the descendants of Poles that settled in Germany many generations ago. Speaking Frankly James F. Byrnes; Excerpt on the Yalta conference , from his memoirs. Triumph and Tragedy Winston Churchill; Excerpt on the Yalta conference , from his memoirs. Anthony Eden, The Reckoning (London, 1965) p. 427. Ibid., Bohlen Minutes, p. 669. US Dept of State, Foreign Relations of the US, The Conference of Berlin (Potsdam) 1945, vol. II pp. 1522-1524. Heitmann, Clemens Die Stettin-Frage: Die KPD, die Sowjetunion und die deutsch-polnische Grenze 1945. Zeitschrift für Ostmitteleuropa-Forschung, 2002, vol. 51, no1, pp. 25-63.